TAD Patrons, His Excellency General The Honourable David Hurley AC DSC (Ret’d), Governor of New South Wales and Mrs Linda Hurley, hosted a reception at Government House to mark TAD&apos;s 40th year. 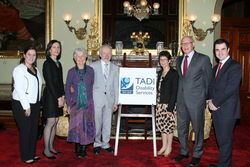 Also in attendance were TAD Founder, George Winston and his wife Jean and Melanie Gibbons MP, Member for Menai. The Governor thanked everyone in attendance for being a part of TAD’s history and that he and Mrs Hurley felt quite privileged to host the gathering for this milestone. The Governor acknowledged George Winston AM, the founder of TAD Disability Services, for gathering the first group of engineers to form TAD and thanked him for his many years of work. “Beyond the engineering and the imagination that goes into the individualised and personalised solutions, is the greater good that you’ve done form this organisation.” The Governor said. “Everyone in this room knows the value of what you’ve achieved in that last forty years and look forward to what you can achieve in the future. This is about the dignity of people and doing our utmost that whatever disability or illness is holding them back, you can find a way forward. Thank you for your service to the Australian community.” The Governor finished. Chief Executive Officer, Danny Kapustin then responded to the Governors kind words. “The tradition of the Governor being the Patron of TAD dates back to Sir Roden Cutler and it is both fitting and most appreciated we are marking this milestone at Government House today.” Danny said. “TAD has completed 600 projects in the last 12 months, 200 Freedom Wheels bikes, thousands of volunteer hours and we estimate since 1975 there has been 31,000 projects our volunteers have designed and built for people living with a disability. And that is an amazing figure when you think about the significant impact on people with disabilities over the years.” Danny continued. Danny invited the attendees to reflect on their own contributions whether it be through volunteering, providing generous funding to TAD programs or to purchase TAD House, volunteering on the Board or other professional services. “The changes to the sector with the NDIS and new technologies present TAD with opportunities to re-invent ourselves and we’ve already started down that path by experimenting with 3D printing and looking at other emerging technologies and how we might benefit. So I’m very confident that TAD will be around for another 40 years.” Danny said. The new TAD logo to mark the significant milestone, designed with the support of GIO Insurance, TAD’s Platinum Partner was revealed and guests enjoyed mingling and telling stories of their experiences with TAD Disability Services. The visit concluded with Danny Kapustin and Monica Vardabasso presenting the Governor with a Freedom Wheels model bike as a gift of our appreciation for his time and efforts in marking our 40th anniversary and starting our 4th decade in such a positive manner.